The new location, outside of Boston, will provide a better distribution point as well as a larger facility to serve the Boston Metro and Greater New England area. We expect the new location will better serve our customers since it is closer to our main markets in Massachusetts, Connecticut, Rhode Island, New Hampshire, Maine and Vermont and also provides our crews, engineers and customers more and efficient work space. 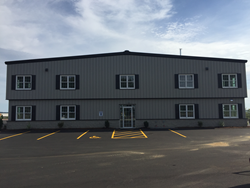 Mabey Inc. announces the new location for its Massachusetts customers at 12 Commerce Road, Shrewsbury, MA 01545. The construction equipment rental company outgrew their old space and moved to a new 4.4 Acre site that accommodates more equipment and provides easy in-and-out access for trucks and transport to major routes. The location also has an upgraded yard surface built to handle their heavy equipment which includes Structural Shoring, Bridging, Site Access and Matting solutions. "We expect the new location will better serve our customers since it is closer to our main markets in Massachusetts, Connecticut, Rhode Island, New Hampshire, Maine and Vermont and also provides our crews, engineers and customers more and efficient work space," said Patrick Sweeney, COO of Mabey Inc.
For more information on Mabey Inc. and the new location, please visit https://www.mabey.com/us/mabey-near-you?type=locations. For over 25 years, Mabey Inc. has been a leader in engineered solutions for construction equipment rentals, including structural and excavation shoring, bridging, site access and temporary roadways. Headquartered near Baltimore, MD, Mabey Inc. has 10 depot locations throughout the East Coast. In addition to construction equipment, Mabey Inc. provides professional engineering services, on-site technical advisors and hands-on safety training.